Ancient humans and elephants shared DNA that allowed them to adapt to the bitterly cold prehistoric environments, scientists have shown. Three studies looking at genes found in both the now-extinct species and found evidence of DNA that regulates heat generation, fat storage increases hair and skin growth. Neanderthals and woolly mammoths lived alongside each other during the European ice age, and their genes evolved in a similar way to adapt to the cold conditions. 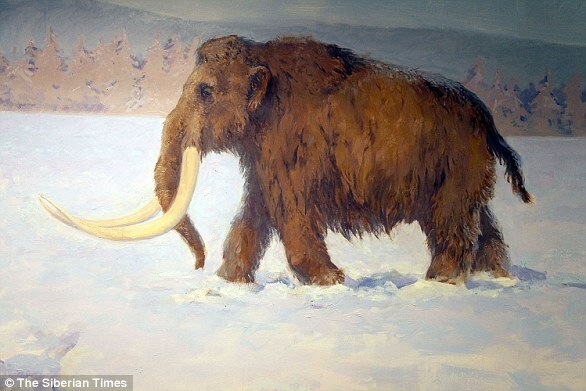 A new study, published in the journal Human Biology, suggests that the genetic profiles of two extinct mammals the woolly mammoths and Neanderthals, shared characteristics of adaptation to cold environments at the DNA and molecular level. 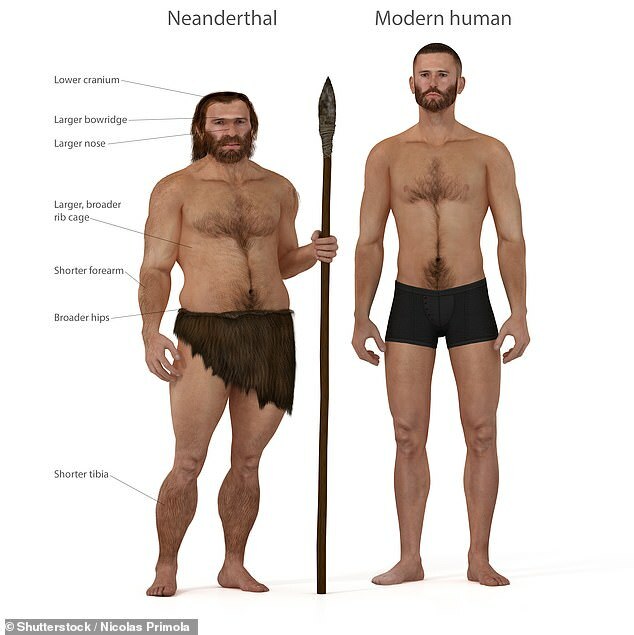 Both species have African ancestry but whereas the woolly mammoths evolved in Africa and before moving across to Europe around 500,000 years ago, the Neanderthals fully evolved in Europe. During the ice age in Europe they lived alongside each other under harsh and cold conditions. 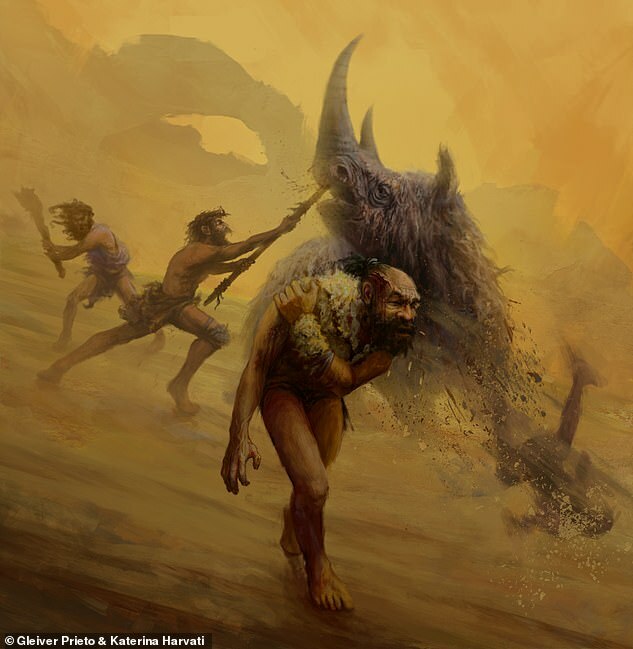 This means they would have been in physical contact under the same environment, said Professor Ran Barkai, at the department of archaeology at Tel Aviv: ‘Neanderthals and mammoths lived together in Europe during the Ice Age. ‘The evidence suggests that Neanderthals hunted and ate mammoths for tens of thousands of years and were actually physically dependent on calories extracted from mammoths for their successful adaptation. ‘Are there genetic similarities between evolutionary adaptation paths in Neanderthals and mammoths? 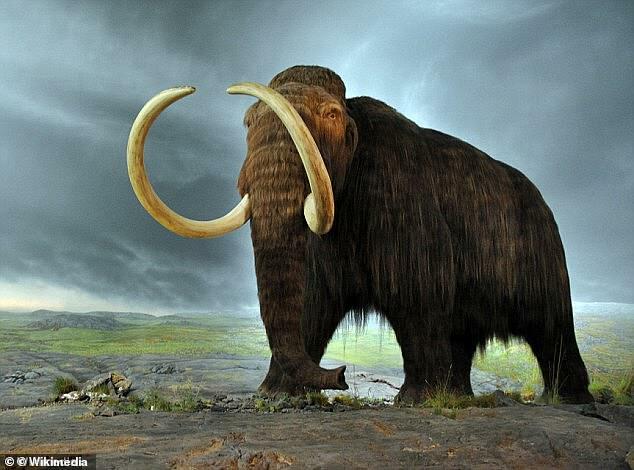 WHAT DO WE KNOW ABOUT THE WOOLLY MAMMOTH? Their trunks had ‘two fingers’ at the end to help them pluck grass, twigs and other vegetation. They get their name from the Russian ‘mammut’, or earth mole, as it was believed the animals lived underground and died on contact with light – explaining why they were always found dead and half-buried. Neanderthals are commonly thought to have relied on dangerous close range hunting techniques, using non-projectile weapons like the thrusting spears depicted here. The Neanderthals were a close human ancestor that mysteriously died out around 50,000 years ago. The species lived in Africa with early humans for hundreds of millennia before moving across to Europe around 500,000 years ago. They were later joined by humans taking the same journey some time in the past 100,000 years. A growing body of evidence points to a more sophisticated and multi-talented kind of ‘caveman’ than anyone thought possible. The study suggest that the genetic similarities date back to the ancient African origins and may explain why some similar adaptations occurred on the genetic level. The two species would have faced similar adaptive pressures and the scientists have evidence this happened at the genetic level. The scientists studied three genes associated with climate adaptions. In their first study, the scientists found the LEPR gene, related to thermogenesis and the regulation of adipose tissue and fat storage throughout the body was present in both species. The second case study engaged genes related to keratin protein activity in both species. The third case study focused on skin and hair pigmentation variants in the genes MC1R and SLC7A11.